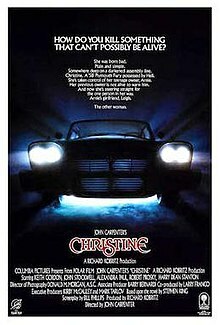 Christine is a 1983 American supernatural horror film directed by John Carpenter and starring Keith Gordon, John Stockwell, Alexandra Paul, Robert Prosky and Harry Dean Stanton. The film also features supporting performances from Roberts Blossom and Kelly Preston. Written by Bill Phillips and based on Stephen King’s 1983 novel of the same name, the movie follows the changes in the lives of Arnie Cunningham, his friends, his family, and his teenage enemies after Arnie buys a vintage 1958 Plymouth Fury named Christine. Strange things happen and the viewers learn the car's secret: That it is possessed by a malign spirit out to even the score with anyone who does the car – or its owner – wrong. Upon its release, the film grossed $21 million at the US box office. Despite a lukewarm reception among critics, the film has become a cult classic. In September 1957, at a Chrysler Corporation assembly plant in Detroit, the hood of a newly assembled, custom-painted 1958 Plymouth Fury slams down without warning and crushes the hand of a line worker inspecting its front end. Another worker climbs in to sit behind the wheel, letting the ash from his cigar fall on the front seat. At the end of the shift, the line supervisor notices the worker slumped in the seat and opens the door; the worker falls to the floor dead, a look of terror on his face. Twenty-one years later, in September 1978, Arnold "Arnie" Cunningham is an awkward and unpopular teenager in Rockbridge, California, with only one friend, football player Dennis Guilder. Arnie's life begins to change when he buys a used, badly battered red-and-white 1958 Plymouth Fury named "Christine" (the same car from the assembly plant) from George LeBay, brother of the original owner Roland LeBay (who is now deceased), and is in need of extensive repairs. Since his parents will not let him keep the car at their house, Arnie begins to restore it at a do-it-yourself garage and junkyard owned by Will Darnell. As he spends more of his time working on the car, he discards his glasses, dresses more like a 1950s greaser, and develops an arrogant, paranoid personality. Unbeknownst to Arnie, Dennis learns from Arnie's mom that the previous owner died in Christine, and confronts George LeBay to find out more: the owner's daughter choked to death in it; his wife committed suicide in it; and Roland eventually did the same. George also tells Dennis that Roland tried to get rid of Christine after Roland's wife died in the car, but Christine "came back three weeks later." During a football game, Dennis becomes distracted by the sight of Arnie kissing his new girlfriend, Leigh Cabot (the new girl in school) in front of Christine and is tackled, suffering a career ending injury. On a rainy evening at a drive-in movie, Christine's windshield wipers stop working. Arnie goes outside to try to get them working again and while he's outside the car Leigh begins to choke on a hamburger. Christine locks the doors and Arnie cannot get in to help Leigh, but Leigh manages to pull the lock open and is saved when a man in the car next to them administers the Heimlich maneuver. Angry with Arnie over being expelled after a confrontation in shop class, school bully Buddy Repperton vandalizes Christine with the help of his gang. Arnie is devastated and determined to repair Christine, but is surprised to see it quickly restore itself to showroom quality as he watches. Christine drives off by itself to seek out the vandals, crushing one in an alley, triggering a gas station explosion that kills two others and sets the car on fire, and finally running down Buddy himself. After the badly burned Christine returns to Darnell's garage, Darnell climbs in to sit behind the steering wheel and is crushed to death when Christine pushes the driver's seat forward. The next morning, Christine is back in its slot and fully repaired. State police detective Rudolph Junkins becomes suspicious of Arnie, having discovered paint from Christine at the scenes of two gang members' deaths. However, he has no direct evidence to implicate Arnie, who has an alibi. Junkins either does not know or cannot believe that Christine can drive itself. Dennis and Leigh conclude the only way to save Arnie is to destroy Christine. They set a trap for it at Darnell's garage; Dennis waits at the controls of a bulldozer, while Leigh stands ready to close the garage doors and cut off Christine's retreat once it enters. However, Christine has been lying in wait under a pile of debris in the garage the entire time, and when Leigh takes up her position at the door controls, it strikes. Christine crashes through Darnell's office in an attempt to get at Leigh. Arnie - who has been driving the car himself - is thrown through the windshield and impaled on a shard of glass, which kills him. Dennis and Leigh attack Christine with the bulldozer, but it continually repairs itself and strikes back. The battle continues until they repeatedly drive back and forth over the car, damaging Christine so much that it is unable to immediately regenerate. A few days later, Dennis, Leigh, and Junkins watch as Christine's remains - compacted into a cube by a car crusher - are dropped into a junkyard. The camera zooms in to a close-up of the front grille, where a piece of metal moves slightly. Producer Richard Kobritz had previously produced the miniseries Salem's Lot, also based on a Stephen King novel. Through producing the miniseries, Kobritz became acquainted with King, who sent him manuscripts of two of his novels, Cujo, and Christine. Kobritz purchased the rights to Christine after finding himself attracted to the novel's "celebration of America's obsession with the motorcar." Kobritz's first choice for director was John Carpenter, who was initially unavailable due to two projects: an adaptation of another King novel, Firestarter, and an adaptation of the 1980 Eric Van Lustbader novel The Ninja. However, production delays on these projects allowed Carpenter to accept the director position for Christine. According to Carpenter, Christine was not a film he had planned on directing, saying that he directed the film as "a job" as opposed to a "personal project." He had previously directed The Thing (1982), which had done poorly at the box office and led to critical backlash. In retrospect, Carpenter stated that upon reading Christine, he felt that "It just wasn't very frightening. But it was something I needed to do at that time for my career." King's novel, the source material for Carpenter's film, made it clear that the car was possessed by the evil spirit of its previous owner, Roland D. LeBay, whereas the film version of the story shows that the evil spirit of the car manifested itself on the day it was built. Other elements from the novel were altered for the film, particularly the execution of the death scenes, which the filmmakers opted for a more "cinematic approach." Initially, Columbia Pictures had wanted to cast Brooke Shields in the role of Leigh due to her publicity after the release of The Blue Lagoon (1980), and Scott Baio as Arnie. The filmmakers declined the suggestion, opting to cast young actors who were still fairly unknown. Kevin Bacon auditioned for the role, but opted out when offered a part in Footloose (1984). Carpenter cast Keith Gordon in the role of Arnie after an audition in New York City; Gordon had some experience in film, and was also working in theater at the time; John Stockwell was cast at an audition in Los Angeles. Nineteen-year-old Alexandra Paul was cast in the film after audition in New York City; according to Carpenter, Paul was an "untrained, young actress" at the time, but brought a "great quality" about the character of Leigh. According to Paul, she had not read any of King's books or seen Carpenter's films, and read the novel in preparation. Christine was shot largely in Los Angeles, California, while the location for Darnell's garage was located in Santa Clarita. Filming began in April 1983, merely days after the King novel had been published. The film's stunts were primarily completed by stunt coordinator Terry Leonard, who was behind the wheel of the car during the high-speed chase scenes, as well as the scene in which the car drives down a highway engulfed in flames. 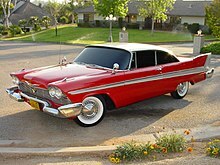 Although the car in the film is identified as a 1958 Plymouth Fury—and in 1983 radio ads promoting the film, voiceover artists announced, "she's a '57 Fury"—two other Plymouth models, the Belvedere and the Savoy, were also used to portray the malevolent automobile onscreen. John Carpenter placed ads throughout Southern California searching for models of the car, and was able to purchase twenty-four of them in various states of disrepair, which were used to build a total of seventeen copies of the film car. All cars were two door hardtops. Total production for the 1958 Plymouth Fury was only 5,303, and they were difficult to find and expensive to buy at the time. In addition, the real-life Furys only came in one color, "Buckskin Beige", seen on the other Furys on the assembly line during the initial scenes of the movie. The Fury also got anodized gold trim on the body and Fury script on the rear fender. In order to bypass the problem of obtaining the rare trim, the cars featured the more common Belvedere "Dartline" trim. Several vehicles were destroyed during filming, but most of the cars were Savoy and Belvedere models dressed to look like the Fury. At least one '57 Savoy was used, its front end modified to look like a '58. Originally, Carpenter had not planned to film the car's regeneration scenes, but decided after the shoot had finished to include them. The shots of the car regenerating itself were shot in post-production and done using hydraulics. Of the twenty three cars used in the film, the best known surviving vehicle was rescued from a junkyard and restored by collector Bill Gibson of Pensacola, Florida. Christine was released in North America on December 9, 1983, to 1,045 theaters. In its opening weekend Christine brought in $3,408,904 landing at #4. The film dropped 39.6% in its second weekend, grossing $2,058,517 slipping from fourth to eighth place. In its third weekend, it grossed $1,851,909 dropping to #9. The film remained at #9 its fourth weekend, grossing $2,736,782. In its fifth weekend, it returned to #8, grossing $2,015,922. Bringing in $1,316,835 in its sixth weekend, the film dropped out of the box office top ten to twelfth place. In its seventh and final weekend, the film brought in $819,972 landing at #14, bringing the total gross for Christine to $21,017,849. Based on 26 reviews collected by Rotten Tomatoes, Christine has an overall 69% approval rating from critics with the consensus saying: "The cracks are starting to show in John Carpenter's directorial instincts, but Christine is nonetheless silly, zippy fun." and an average score of 5.9 out of 10. Variety gave the film a negative review, stating: "Christine seems like a retread. This time it’s a fire-engine red, 1958 Plymouth Fury that’s possessed by the Devil, and this deja-vu premise [from the novel by Stephen King] combined with the crazed-vehicle format, makes Christine appear pretty shop worn." Roger Ebert gave the movie three out of four stars, saying: "by the end of the movie, Christine has developed such a formidable personality that we are actually taking sides during its duel with a bulldozer. This is the kind of movie where you walk out with a silly grin, get in your car, and lay rubber halfway down the Eisenhower." Janet Maslin of The New York Times gave the film a middling review, saying: "The early parts of the film are engaging and well acted, creating a believable high-school atmosphere. Unfortunately, the later part of the film is slow in developing, and it unfolds in predictable ways." Time Out said of the film: "Carpenter and novelist Stephen King share not merely a taste for genre horror but a love of '50's teenage culture; and although set in the present, Christine reflects the second taste far more effectively than the first." The film was released on VHS by Columbia Pictures, and later in a special edition DVD in 2004. On March 12, 2013, Twilight Time video released the film on Blu-ray for the first time in a limited edition run numbered at 3,000 copies. On September 29, 2015, Sony Pictures Home Entertainment re-released the film on Blu-ray. The film was released on 4K UHD Blu-Ray on September 11, 2018. Two soundtracks were released, one consisting purely of the music written and composed by John Carpenter and Alan Howarth, the other consisting of the contemporary pop songs used in the film. George Thorogood and the Destroyers – "Bad to the Bone"
Buddy Holly & the Crickets – "Not Fade Away"
Johnny Ace – "Pledging My Love"
Robert & Johnny – "We Belong Together"
Little Richard – "Keep A-Knockin'"
Dion and The Belmonts – "I Wonder Why"
The Viscounts – "Harlem Nocturne"
Thurston Harris – "Little Bitty Pretty One"
Danny & The Juniors – "Rock n' Roll is Here to Stay"
John Carpenter & Alan Howarth – "Christine Attacks (Plymouth Fury)"
Larry Williams – "Bony Moronie"
ABBA – "The Name of the Game"
Ritchie Valens – "Come on, Let's Go"
Tanya Tucker – "Not Fade Away"
The Rolling Stones – "Beast of Burden"
^ Muir, John Kenneth (2005). The Films of John Carpenter. McFarland & Company. p. 30. ISBN 9780786422692. ^ a b "Overall Box Office". Box Office Mojo. Retrieved October 22, 2010. ^ "Christine". Static Mass Emporium. Retrieved September 27, 2016. ^ a b c d e f g h Carpenter, John; Kobritz, Richard (2004). Christine: Ignition. Sony Pictures Home Entertainment. ^ Martin, R.H. (January 1984). "Richard Kobritz and Christine". Fangoria (32): 14–18. ^ a b "Extracts from SFX Interview with John Carpenter". SFX. Retrieved November 28, 2015. ^ Carpenter, John. Audio commentary, Christine [Blu-ray]. Sony Pictures Home Entertainment. 2015. ^ a b c d Carpenter, John; Gordon, Keith; Paul, Alexandra; Stockwell, John (2004). Christine: Fast and Furious. Sony Pictures Home Entertainment. ^ a b Von Doviak 2014. ^ Kerr & Wollen 2004, p. 355. ^ Benjaminson 1994, p. 124. ^ "Christine (1983)". Box Office Mojo. Retrieved November 28, 2015. ^ "Christine Movie Reviews". Rotten Tomatoes. IGN Entertainment. Retrieved January 5, 2019. ^ Variety Staff (December 31, 1982). "Christine". Variety. Retrieved November 28, 2015. ^ Ebert, Roger (December 13, 1983). "Christine". Chicago Sun-Times. Retrieved November 27, 2015. ^ Maslin, Janet (December 9, 1983). "Film: 'Christine,' A Car". The New York Times. Retrieved March 25, 2019. ^ Rothkopf, Joshua (January 23, 2017). "Christine, directed by John Carpenter". Time Out London. Retrieved November 27, 2015. ^ "Christine (Special Edition)". Amazon. Retrieved November 27, 2015. ^ Kauffman, Jeffrey (March 18, 2013). "Christine Blu-ray: Screen Archives Entertainment Exclusive / Limited Edition to 3000". Blu-ray.com. Retrieved November 28, 2015. ^ Liebman, Mark (September 28, 2015). "Christine Blu-ray". Blu-ray.com. Retrieved November 28, 2015. ^ Duarte, M. Enois (September 5, 2018). "Christine - 4K Ultra HD Blu-ray". ultrahd.highdefdigest.com. Retrieved June 12, 2018. ^ "Christine – Production Credits". AllMusic. Retrieved October 22, 2010. ^ "Christine (Original Motion Picture Soundtrack)". Discogs.com. Retrieved May 31, 2015. Benjaminson, James (1994). Plymouth, 1946-1959. Motorbooks International. ISBN 978-0-87938-840-9. Von Doviak, Scott (2014). Stephen King Films FAQ: All That's Left to Know About the King of Horror on Film. Applause Theatre & Cinema. ISBN 978-1-48035-551-4. Kerr, Joe; Wollen, Peter (2004). Autopia: Cars and Culture. University of Chicago Press. ISBN 978-1-86189-132-7. This page was last edited on 5 April 2019, at 15:37 (UTC).